ADAMS, Samuel, (uncle of Joseph Allen; granduncle of Charles Allen; cousin of John Adams), a Delegate from Massachusetts; born in Boston, Mass., September 27, 1722; graduated from Harvard College, Cambridge, Mass., 1740; M.A., Harvard College, Cambridge, Mass., 1743; brewer; tax collector, Boston, Mass., 1756-1764; member of the Massachusetts general court, 1765-1774; member of the Continental Congress, 1774-1781; signer of the Declaration of Independence; member of the Massachusetts state constitutional convention, 1779; president of the Massachusetts state senate, 1781; member of the Massachusetts state constitutional convention, 1788; unsuccessful candidate for election to the First Congress in 1788; lieutenant governor of Massachusetts, 1789-1794; governor of Massachusetts, 1794-1797; died on October 2, 1803, in Boston, Mass. ; interment in Granary Burial Ground, Boston, Mass. 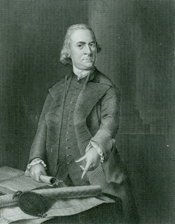 Irvin, Benjamin H. Samuel Adams: Son of Liberty, Father of Revolution. New York: Oxford University Press, 2002.